Married Zimbabweans who leave their partners back home when they look for work in South Africa say distant relationships are wrecking their marriages. Many say they end up divorcing as their partners end up resorting to extra-marital affairs in order to quench their sexual needs.Zimbabwean father of two, Sam Ndlovu, says when he married his former wife, Annah Sithole, in 2005, they were a good, loving and happy couple. However, during the peak of the Zimbabwean economic crisis in 2008, Ndlovu left his wife in Zimbabwe and moved to South Africa where he found a job as a waiter.He says accusations of infidelity emerged from both sides turning their marriage into a battlefield. This created so much hostility that they ended up divorcing in 2010.This, he says, is a challenge faced by many married men and women who leave their spouses in Zimbabwe. "It does destroy marriages because we are not stones. We have got feelings and this thing called temptation it's not a joke. You know we are easily tempted as long as you are away from your spouse, the chances of being tempted are high and the risk of getting infected with these sexually transmitted diseases are very high," says Ndlovu.Another Zimbabwean says his wife ended up being impregnated by a lover when he left her back home.A number of men also admit that they resort to "small houses", a cynical term for girl friends or women they co-habit with, without the knowledge of their wives. And Yvonne Chombo, originally from Chitungwiza, says unless something is done fast, many of these married men and women are heading for divorce. "There is a lot of cheating in almost all long distance relationships because you know me I'm a lady and he is in Zimbabwe, he is also a man. You know what I'm talking about. It's been so hard," says Yvonne. Precious Makomva is working as a nurse in Johannesburg while her husband works as a lawyer in Zimbabwe. She says having to maintain two homes, paying house rentals in both countries, and frequent travelling to visit each other is costing them dearly. "It's challenging. You know we end up just working for rent and food. It's a very big challenge that one. It's like we are just working to live, not like we can do something like l can build a house or what, we cannot do those things, we are just surviving." 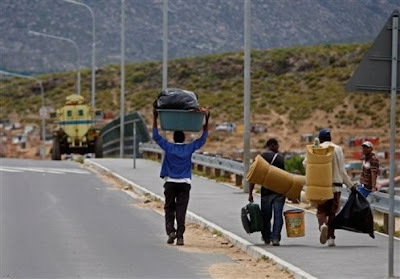 Sam Ndlovu adds that having his children grow out of his sight is the most traumatic experience for him.To make matters worse, he says the South African immigration system, makes it almost impossible for ordinary Zimbabweans to bring their families to the neighbouring nation. "I'm not very certain about my future here because I don't know what will happen if my permit expires. So, for me to bring them here I will be risking. It's better for them to be at home where I know that it's their permanent residence. There would be nothing that is going to disturb them." But these Zimbabweans share the same dream that if their country's economy fully recovers to create enough jobs, they will return home and permanently stay with their families.